Home › Christmas › So What About Hanukkah? I remember as a kid how we used to say “Merry Christmas and Happy New Year!” everywhere we went. We’d often get reminded to also say “Happy Hanukkah” for our Jewish friends. These messages used to be plastered around every retail store, highway billboard, and holiday television commercial. What a difference a lifetime makes. Now one says “Merry Christmas” at the risk of offending someone, or worse, thinking you’re offending someone. What silliness the anti-Christian collective has wrought upon us. But apart from that, is it my imagination or do we just not hear as much ‘Happy Hanukkah’ these days? And what’s the real story behind Hanukkah anyway? You may be surprised how it’s very much tied to the Christmas story. In 167 B.C. , Antiochus IV Epiphanes blasphemed the Jewish Temple in Jerusalem. This region had been long-ruled by Greeks since the time of Alexander the Great, who died in 323 B.C. His kingdom was divided up by his generals and the Seleucid family, of which Antiochus IV descended, controlled the homeland of Israel. Antiochus IV was brutal and disrespectful of Jewish culture and religion. He sought to “Hellenize” the Jews (override their culture with Greek culture) while he robbed the Temple treasury, erected a statue of Zeus there and demanded worship and pig sacrifices to the pagan deity. In a story of intrigue and heroism worthy of a movie, a father and his 5 sons (the Maccabees) begin a Jewish revolt against the evil ruler and ultimately gain control of the Temple and Jerusalem and restore order and tradition. One of the sons, Judas Maccabeus, emerged as a key leader, almost a Messiah-figure. His heroics ushered in the era of Messiah-watching among the Jews. By the way, this story is in the Book of Maccabees, found in the Apocrypha, a handful of books not included in the Biblical canon as non-God inspired. The Maccabee story as a historical account was also separately validated by Josephus, renown contemporary first century historian. 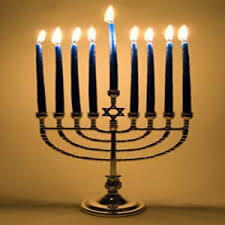 Hanukkah, sometimes called the Feast of Dedication or the Feast of Lights, is an eight-day celebration to commemorate the re-dedication of the Temple in 164 B.C. The celebration involves the lighting of candles each night on a nine-branch menorah, singing hymns, eating special food, and even exchanging gifts. Whether Hanukkah celebrations are really in decline is open to debate. Traditions are waning as generations grow older. But ask your own Jewish friends about their own recognition of this important event in their faith. As explained in the previous post, Jesus was born into this world in the midst of an uncanny series of events and circumstances that cannot be denied. The entire Old Testament from Genesis 3:15 onward foreshadows a coming seed, a redeemer, a Messiah, the Savior of the world. Reading the Bible without an eye on the symbolic and specific references to the Coming King is to misunderstand and miss the point. Jesus was the real Messiah. The Maccabean Revolt was only part of Jewish history which predated the real revolution – the One who came and lived among us and conquered death and was resurrected. He gave men many clues and was revealed in the Scriptures. Can you relate to both Hanukkah and Christmas?